Hello, and thanks for stopping by my site, hosted by my dear friend Erik Wile. On this page you can find out everything you need to know about my big adventure: a self-supported bicycle trip from Maine to British Columbia to California, from June-October 2005. For those of you who know me already, skip this section. For those of you who don't, my name is Dena and I'm from Cambridge, MA. After wrapping up a PhD in biology, I am taking a few months off to pursue my biggest non-scientific passion: bike touring. In the summer of 1998, after graduating from college, I rode my bike from Seattle to Washington, D.C. as part of the American Lung Association's GTE Big Ride Across America. I couldn't think of a better way to celebrate the completion of my PhD than another cross-country trip, and I am thrilled to have the opportunity to visit America again. 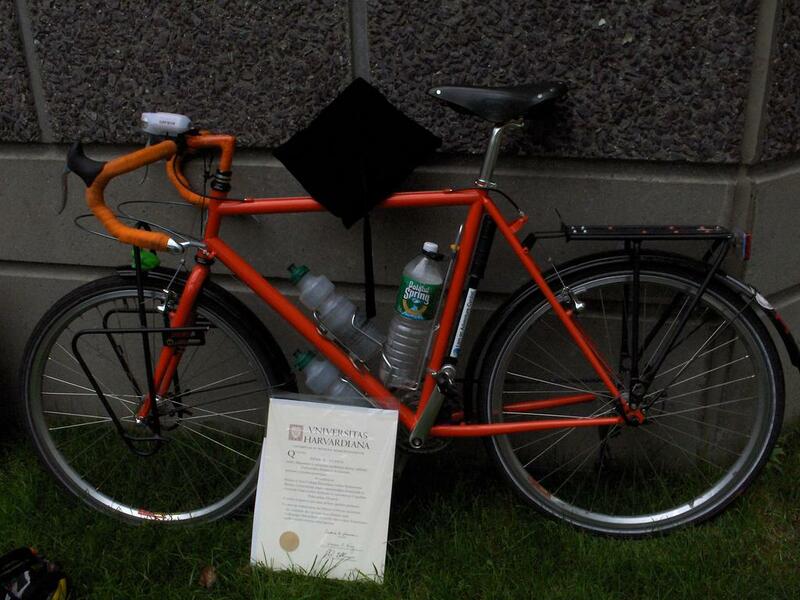 My beloved custom touring bike, affectionately known as "Dagny" was hand-crafted in Holliston, MA by master bike builder Mike Flanigan. You can visit Mike on the web at www.antbikemike.com to see all of the wonderful things that he builds. Mike specializes in bikes that carry stuff, which is critical for bike touring! The touring bike has a long wheelbase, so that it is very stable when loaded up and also to provide enough room in the back for the bags (panniers). The gearing is very low, like a mountain bike, so that I can peddle up big hills easily. Dagny also has heavy-duty wheels for supporting all that weight—fully loaded, the bike weights almost 70lbs! I am riding across North America from east to west: from Portland, ME to Vancouver, BC. Along the way I will pass through Maine, New Hampshire, Vermont, New York, Ontario, Michigan, Wisconsin, Minnesota, North Dakota, South Dakota, Wyoming, Montana, Idaho, Washington, and British Columbia. When I arrive in Vancouver I will be meeting my long-time touring companion Tobias Seidel, who hails from Braunschweig, Germany. He and I will then ride the west coast of the country together, going through Washington, Oregon, and California on our way to San Diego. The entire adventure will take four months, from June 10-October 15. I estimate that during that time I will travel more than 6000 miles under my own power. Most of the routes that I will be using were developed by the Adventure Cycling Association www.adventurecycling.com. In this section you will find my trip journal. I will try to update this section every few days as I make my way around the country. Please check back to see what's new! I will be traveling with a digital camera, so I will also periodically be posting pictures from the road for you to look at. Unfortunately, the pictures will be updated less frequently than the text portion of the site due to technological limitations. The pictures will be broken down by state for your viewing pleasure. 10/04/05 Pictures from some fans in the Cascades! 10/11/05 Added pictures from my parents in Santa Monica, CA.